Many among us have moved to the ‘self-service’ option wherever possible. Technological boom and social media hype could be the reason for this changing pattern. A lot of us are happy making purchases online, sitting back, relaxed in the comfort of our homes rather than shopping at retail stores. A study in the UK shows that almost two-thirds of the customers prefer self check-out counters which allow them to get in and out without the need for any extra communication with store personnel. Similarly, according to a forecast by Forrester, self-service e-commerce is increasing and expected to cost 1 million US B2B sales personnel of their jobs by 2020. Fulfilling customer demands on time will satisfy them and they will return to do business with you again and most likely bring others along, subsequently aiding your business growth. Time is precious, no matter which industry you belong to. Everyone expects quick results. When customers are put on ‘long holds’ or have to repeat themselves to multiple employees to solve a single problem, it puts them off and they avoid using service centers. This might drive them to opt for self-service facilities. 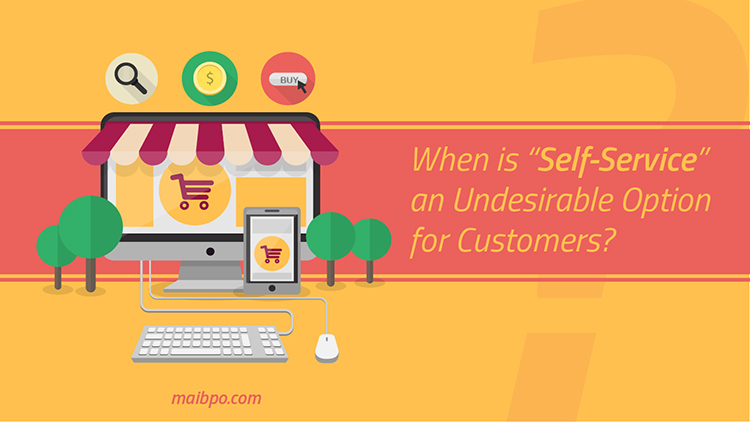 But if you rely only on self-service mode, your competitors might win by providing the personal care a customer might have needed. The ultimate result that a customer seeks from a company is to be able to use their products and services efficiently. Thus, a strong customer service system is essential to achieving customer satisfaction. If the customer wishes to communicate via telephone or chats, they must be catered to without having to repeat themselves multiple times. No customer likes scripted service with poorly trained employees. Companies often move to self-service to cut cost on employees, however, a well-trained human support service team to provide effective and reliable service to customers should always be easily accessible to complement a technologically advanced self-service system. Here are the different approaches adapted by several companies. For example, Zappos encourages one-on-one client-employee service whereas Uber prefers its customers to lodge complaints through their app. There are pros and cons to having just one kind of service in today’s world. If you consider the banking structure now, much has changed in the past few years. Along with increased numbers of ATMs, customer also enjoy the expanded benefits of online banking. But this has not eliminated the need for banks to have qualified employees available to provide personal assistance to customers. Regardless of all the alternate facilities and self-service options, time and again customers still require human assistance. Good service is what sets successful organizations apart from their competitors. The customer service department is the soul of any organization – any investments you make in it strong make your business stronger!